A new gadget to take up all my time has been discovered. 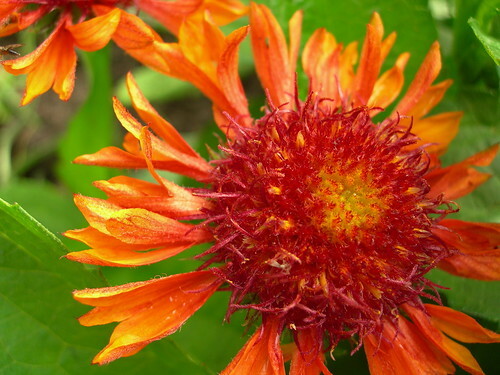 Do you like this photo of the gallardia from our garden? Want to make a quilt of it? No problem! There are options for square, landscape or portrait orientation. 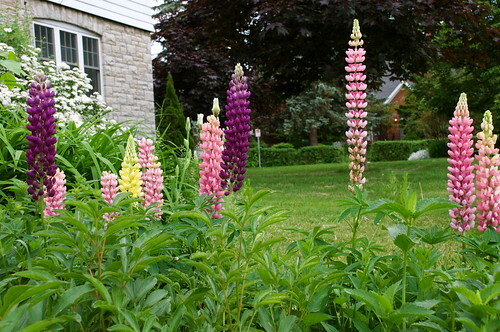 These lupins are in the portrait orientation. 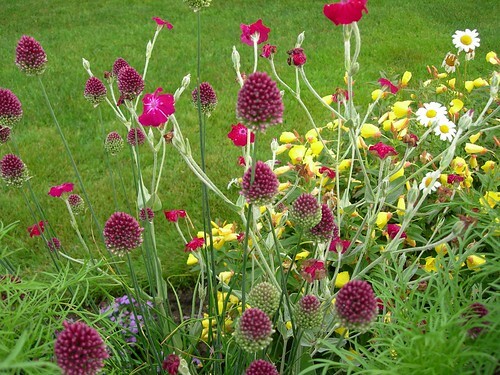 I wondered what this snap of a mass of blooms would look like. 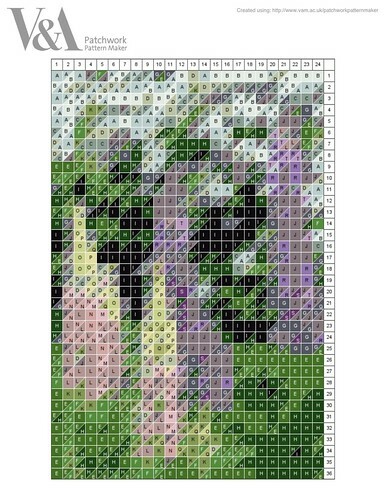 It's a bit harder to view the flowers than the single blooms in the other patterns, but I like the abstract quality that it gives - the flowers are more suggested than represented. 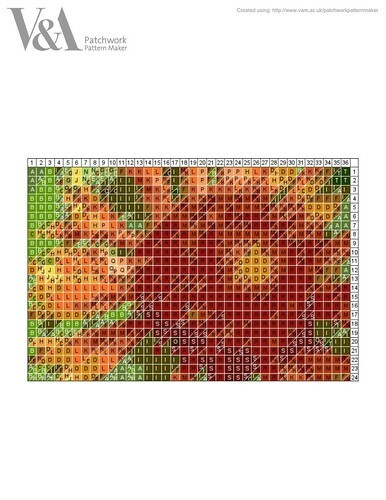 I think it might be fun to make one of these in 1" squares - it wouldn't be very big, around 30 - 36" or so. Imagine, you could make one of your home or cottage, or even your dog or another loved one! Mine are all flowers so far, but the possibilities are endless! What do you think? 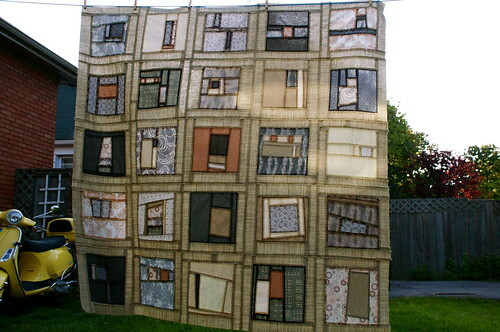 Would you make a quilt like this? Go and make some patterns and show me! 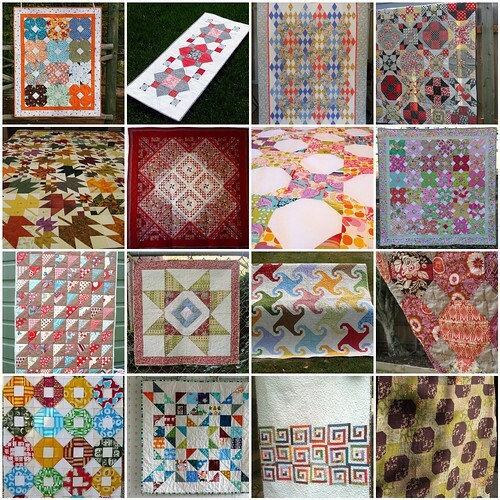 Maybe we can do a quiltalong! 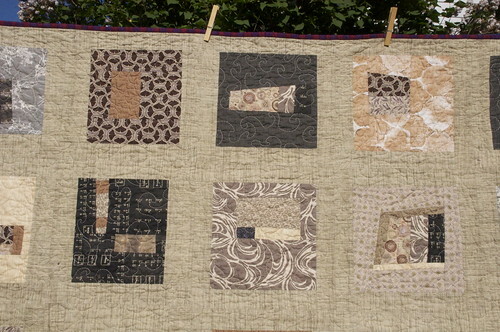 MT swap mini quilt top, originally uploaded by Shadrach Meshach & Abednego. I spent today piecing the top for the Modify Tradition swap. We're to make a small quilt with dimensions somewhere between 12" and 24" and send it off to a mystery partner. After poring over my partner's Flickr mosaic and reading the blurb, I saw that she likes bright colours and modern fabrics on white. I hope she likes this one - it's fairly mini, only 18" square. 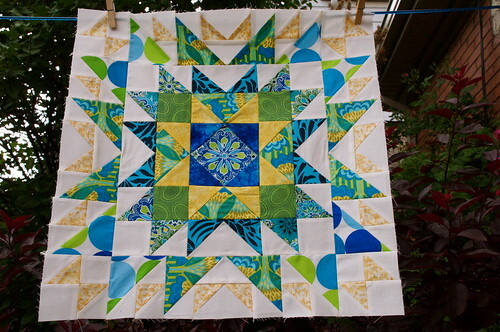 It was my intention to use a lighter colour for the HSTs around the outside, in order to emphasize the starburst quality of the blue/green pieces on the edge. However these gold/white HSTs look like saltines or matzah from a distance. Tarnation - that wasn't the look I was going for! Never mind, on balance I like it and it looks very summery. It reminds me of looking into a swimming pool. We don't have a swimming pool, but we do have a bit of a garden - thanks entirely to the efforts of Mr. Pickledish. 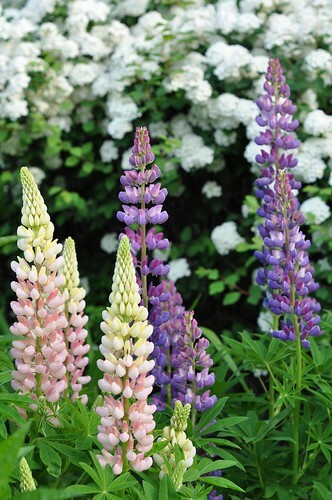 Two of my favourites are now in bloom: poppies and lupins. The winnahs! Ding, ding, ding! two, originally uploaded by Shadrach Meshach & Abednego. Many, many thanks to all of you who entertained me with your small world stories - there are some humdingers out there! 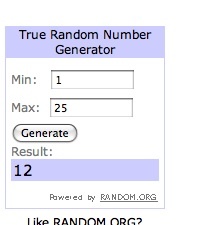 And without further ado, here are the winners of my 100 post giveaway. 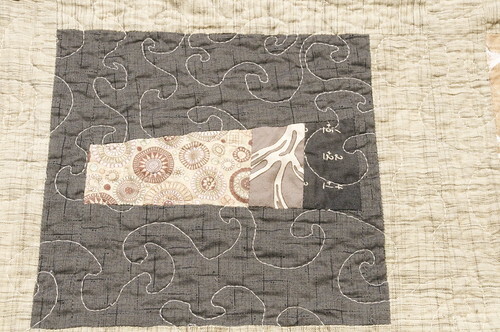 The two metres of fabric goes to comment #2, Elle, who told a story about a new member of her quilt guild who turned out to be the person featured in many stories told by her daughter and son-in-law ! 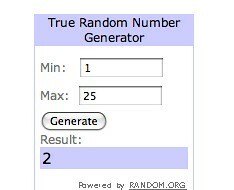 And the patterns go to comment #12, Rene, whose story was about running into friends at a hotel in far away Hawaii! Congratulations, ladies! Please send me your mailing addresses and I'll be popping your loot in the post! I'm so happy I could finish the neutrals quilt in time for the Bloggers' Quilt Festival, as well as listing it as a Sew-n-Tell Friday finish! Heartiest of thanks to everyone who gave me advice on the design and assembly of this quilt. 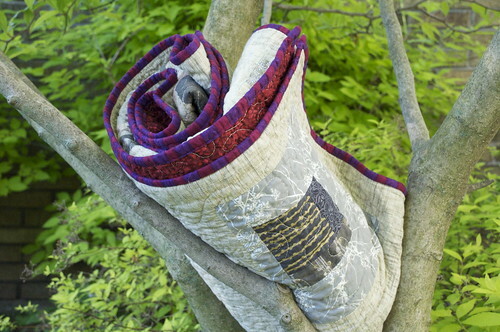 The name of this quilt is Dunes - obvious, but too fitting to resist. 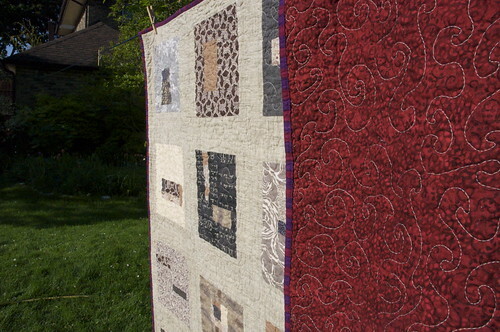 The quilt is going to my friend, Marcia, who moved to the U.S. to take up a new position. I miss her terribly. This is a belated housewarming present for her; it's small - only about 55" square - but I think it will be nice on her lap while she reads her murder mysteries. Marcia does research in mathematics disability; I chose the "math facts" fabric specially to honour her work. She doesn't know it's coming - I hope she will be surprised in a good way! As you can see, I chose a tone-on-tone red for the back. When I asked for help in a previous post, there were so many different colour suggestions! 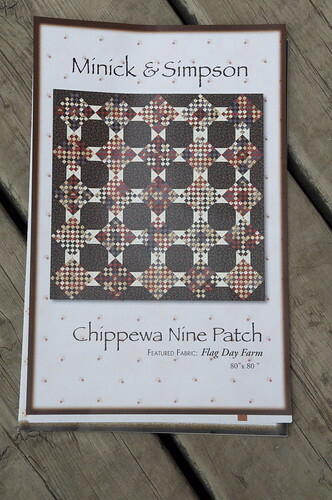 I know each of them would have looked great with this quilt, since the hallmark of neutrals is that they go with anything! I had the fabric in my stash already, with no prior claim on it, and I decided to be economical, for a change. 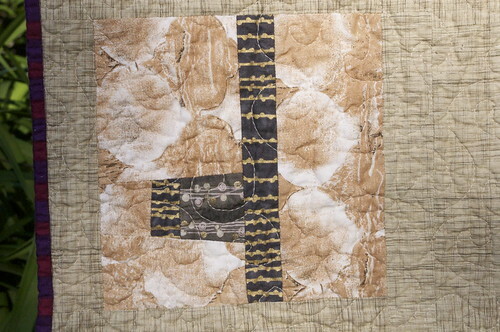 I used a King Tut thread variegated in neutrals for the quilting. I'm not mad about the fact that the quilting shows through on the back, but what can you do? I really dislike the nylon thread option, and I could find nothing that would be mute on both the front and back. 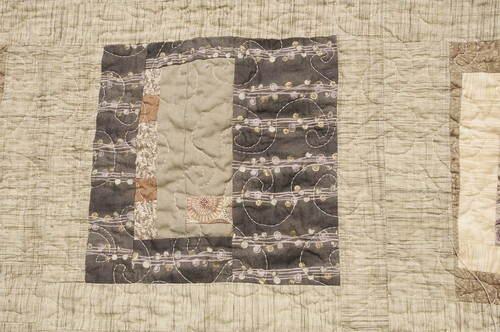 I think the quilting is decent, so it doesn't look as tacky as it might otherwise (I hope). I chose a red and violet stripe for the binding, which I adore! I think it looks great against the neutral front! I hope you don't mind closeups of some of the blocks. Since I'm giving it away, I like to have some photos to remind me of it once it's gone. All through the process I talked about how I felt neutral about this quilt, and how I appreciated it intellectually but not emotionally. Guess what - now that it's all done and washed, I'm in love with it! I hope I can bear to send it on its way south of the border! And what a milestone, friends: this is my 100th blog post! I never would have imagined that blogging would be so rewarding and keep me so focused on being productive, and that I would meet so many warm, interesting and funny women from around the world! And twice, I have met readers (or a proxy, in one case) in real life, and that is purely mindboggling! But it just goes to show that this is a small world we live in, and the internet makes it even smaller. Now, in commemoration of the century mark, I have two giveaways for your lottery pleasure. When considering what to offer, I thought about my readers and who they are and what they like. It seems to me that I have a fairly eclectic bunch of readers - some prefer traditional quilts and others more modern/contemporary styling. And there are those, like me, who seem to like it all. So here's what's on offer. 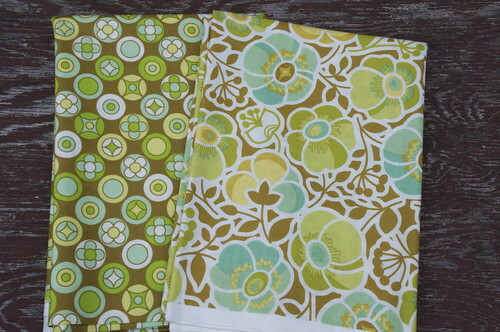 The first is two lengths of Erin McMorris fabric. Each is about one metre/yard. The fabric has not been washed. Our home is nonsmoking, but we do have dogs. BOTH metres will be given away to one winner. 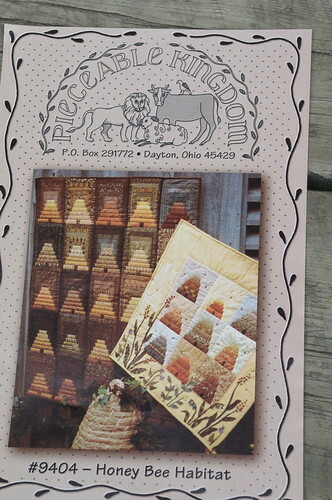 The second is two patterns which I bought when dinosaurs roamed the earth. I don't even know if this company, Pieceable Kingdom, is still around. The patterns have never been used. 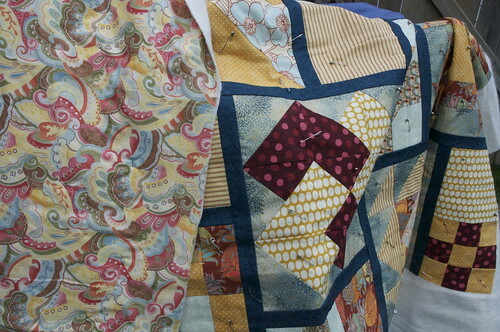 I think both call for a combination of piecing and applique. 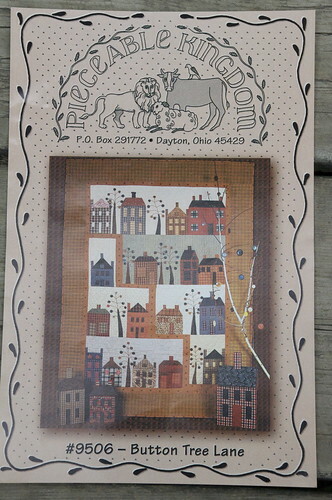 One is a beehive theme and the other is houses and uses buttons to make the trees. BOTH patterns will be given away to one winner. Entries will close at 7pm Sunday, May 23, and I will try to get the goods in the post the following week. I will gladly ship internationally. Here's how to enter. Leave a comment below, and in the comment, tell me two things. FIRST: Would you rather win the fabric or the patterns? And SECOND: Following on the notion of the small world that I mentioned above, please tell me your best "what a small world" story. There are no extra entries for following or Twittering, etc. When I was talking about this in the lab, Lindsay said that I had to tell my own small world story if I was going to ask people to tell theirs. So here is my small world story for you. You know that, although I have lived in Canada for more than 25 years, I was raised in east Tennessee. When I came to Canada for a graduate degree, I met my husband, a Montrealer who had immigrated from the UK at the age of four. It didn't seem like a small world to me then, but a very big, wide world. The South seemed very far away, and my new country and countrymen were more different than I had expected. My in-laws, MIL from Dublin and FIL from England, were charming, and I loved the mid-Atlantic accents that they had. But little did I know that by marrying, my husband and I were joining our family lines for the second, and possibly the third, time! Here's now it happened. Two sisters, Libby and Rachel Jershfelt, were born in Latvia between 1800 and 1809. For several generations, their families lived in Latvia, but just like at the end of Fiddler on the Roof, there came a time where life in the village was no longer sustainable, probably after 1881, following the assassination of Czar Alexander II. Over the 200 years from the birth of Rachel and Libby to the present day, knowledge of and connection between their families was completely lost. One branch of Rachel's descendants got on a boat to Ireland, and her great-great-great-great-great-grandson is my husband. Meanwhile, a branch of Libby's descendants emigrated to Kentucky before the First War, and Libby's great-great-great-grandson married my great aunt in Tennessee in the 30s. (There is some evidence that the lines had crossed by marriage previously in Ireland, but that is less clear.) So when I, as a 22 year old woman, left my home of generations and moved to another country, and married a handsome man who came from across the ocean, I was really marrying a relative! "BY MARRIAGE!" my husband is hollering from the other room. Because I'm a hillbilly, he gets uncomfortable when I don't point that out. So that's my story, friends, and I think you'll agree that that's when you say "What a small world!" Leave your comments for the giveaway! I can't wait to hear your stories celebrating the small world we live in and our many connections to each other! DSC_0022, originally uploaded by Shadrach Meshach & Abednego. Oh my, I am totally crushing on this pattern that arrived in the mail the other day. 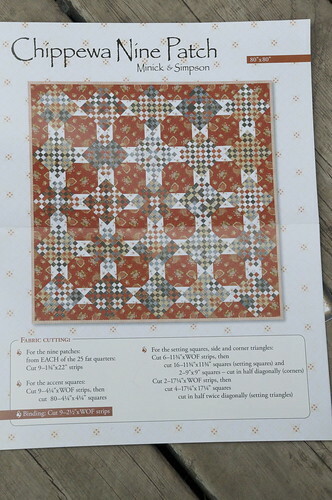 One of the current quilting mags (I'm sorry I can't remember which one) has a spread on Minick and Simpson, and this quilt was featured hanging out on the line. I just flipped for it. 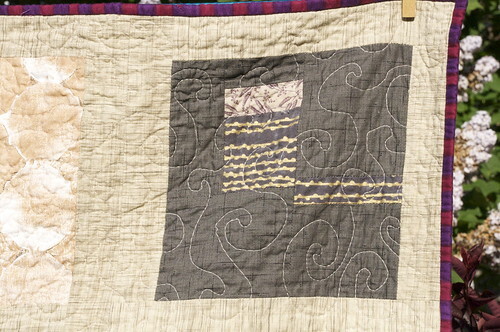 And look, it came with photos of the quilt in two different colourways, and isn't it interesting how different they look? This is going to have to be the next quilt I make for myself. I just adore it. Don't you? P.S. 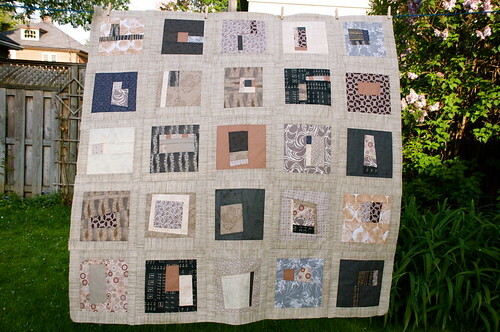 I'm still working towards having the neutrals quilt finished in time for the Bloggers' Quilt Festival on Friday. Depending on how the Canadiens play against Philadelphia tonight, I may or may not get the binding on. Go, Habs, go! P.P.S. This is my 99th blog post. You know what that means, don't you? Modified Tradition sampler in progress, originally uploaded by Shadrach Meshach & Abednego. 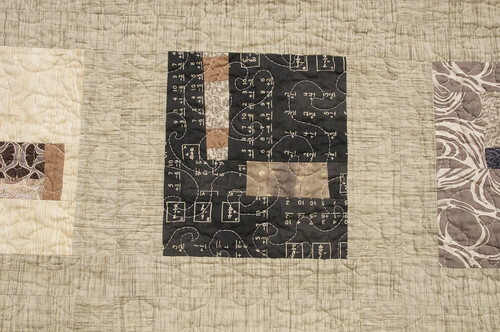 Yesterday I wrote about my productive weekend, and I forgot to say that I had also pin-basted this quilt. It's the sampler from the Modify Tradition first quiltalong, and I finished the quilt top in January. I bought the backing (Posh, I think it's called) when my LQS had a Boxing Day sale, but it's been languishing ever since. I promised Lindsay, my lab manager, that I would bring it into the lab when it's finished. Sometimes when you've been working hard thinking scholarly thoughts you need to stretch out on the sofa and rest your eyes a little. At any rate, that's her story. Quilting in progress, originally uploaded by Shadrach Meshach & Abednego. Yes, friends, I was fairly productive this weekend, huzzah! 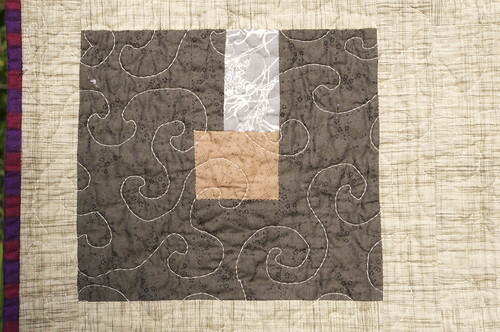 As you can see, I started quilting the neutrals quilt. I was amazed at the range of suggestions offered for the back, whether it should have colour or continue the neutral theme. For the colours, there were so many different suggestions. I liked them all, and think they would all work wonderfully well. I guess it's true that neutrals go with everything! I won't reveal just yet what I decided - I'll leave you all in suspense a little longer! But I have little photographic evidence of the rest of my weekend work, because, in my haste to catch up on my heinously behind bees, I packaged up the two bee blocks that I completed before taking photos. I had a nagging feeling that I had forgotten something. Anyway, believe me when I say they were not evidence of my finest hour. I finally made the gnome home for Sharon of the Incredible Shrinkers, and despite best efforts, this one ended up looking like something a Habitat for Gnomanity team on crack made. I am so sorry, Sharon. I did my best. I also made the two vintage sheet pinwheel blocks for Heather, in the Maple Leaf Bee. So I have caught up with my April bees, which is no real accomplishment, since it's the middle of May. 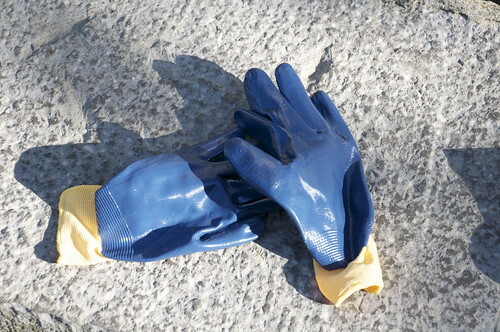 I also wanted to show you these waterproof gardening gloves. Because why? Because tomorrow morning at 6.30 I'll be doing pushups in the mud at a fitness boot camp, and looking forward to four days a week of this regime, for four weeks. Why, oh, why? All I can say is it sounded like a good idea at the time. At least these will keep my hands out of the mud. 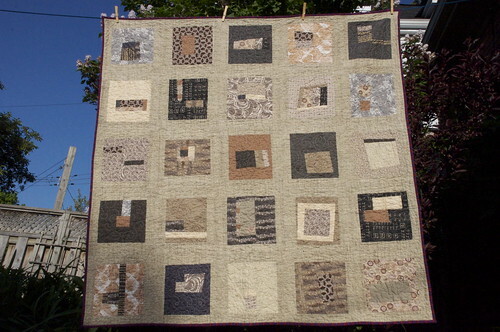 Neutrals quilt top finished, originally uploaded by Shadrach Meshach & Abednego. 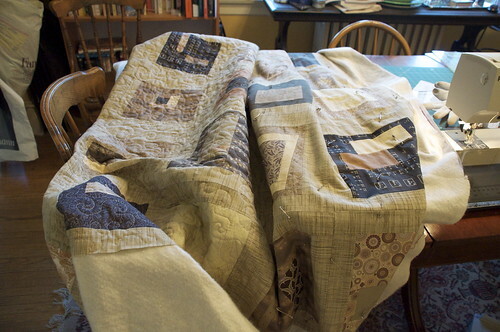 I'm happy to report a flimsy finish for the neutrals quilt that I've been plugging away at. I sashed each block with the cross-weave and then sewed them together. The blocks finished at 11.5", so the finished piece is about 55" square. 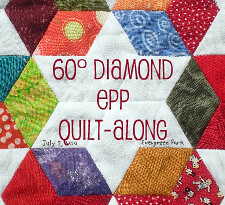 Respectable enough for a smallish lap quilt. I learned two things about myself making this quilt. 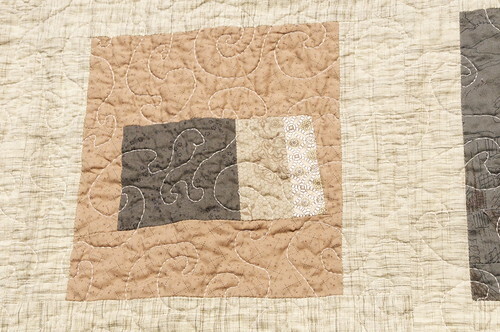 First, as much as I thought I would really like a quilt in a sophisticated palette of taupes, tans, and greys.... I really don't. I appreciate it on an intellectual level, but it doesn't call to me to wrap myself up in it. The second thing I learned is that I am really not an improv quilter. The first few blocks I made were fun and exciting, but as time went on, they became more and more of a chore. Like someone had a gun to my head, saying "Be creative with only these fabrics and only this style right now!" As a result, there are some blocks that are horrible, in my opinion. But I used them all because, after deciding I would go with a 5 x 5 layout, I couldn't force myself to make extra blocks to replace the horrible ones. I also recognized that if I did, the extra blocks would probably be horrible, too. I won't reveal which ones I think are horrible, but if you click through to Flickr and click on the "all sizes" button, you can see the blocks in greater detail and form your own opinion! 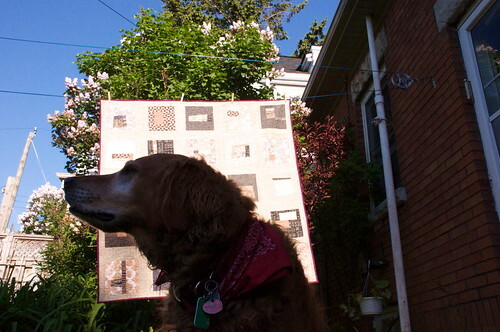 I love this photo of the back of the quilt top, with the sun shining through. Thanks to all of you who helped me with various design decisions along the way. Here's one more question for you. I 'm thinking the back of this quilt should have some colour. What do you think? Rainy day dog, originally uploaded by Shadrach Meshach & Abednego. What a rainy few days we have been having! 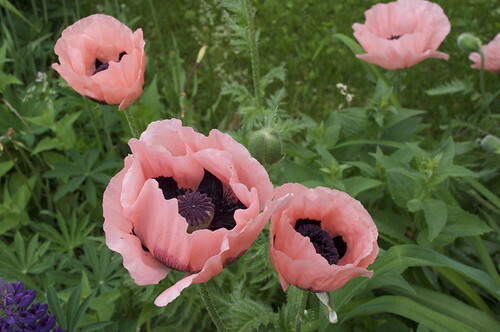 The garden needs it, but one wants a warm, sunny weekend for Mother's Day! I saw this little dog outside a bookstore in Coventry, UK last year. 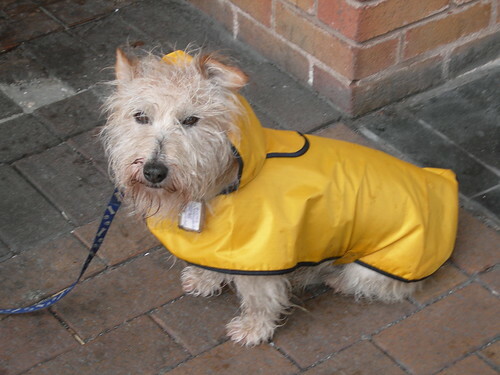 Doesn't he look dapper in his sou'wester? Today was the first day I could get to my sewing machine since I returned from my round of conferences. I am rapidly amassing a pile of WIPs, not to mention my bees, some of which I am shockingly behind on. (I am having a mental block concerning Sharon's gnome homes; I just can't figure out what to make for her!) I decided to work on the neutral blocks, since I see that as the quickest finish. 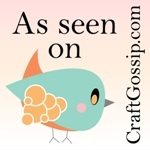 And I would like to have something new to enter in the Bloggers' Quilt Festival put on by Amy's Creative Side. I believe that is the 21st of this month, so I'll have a deadline to work towards. 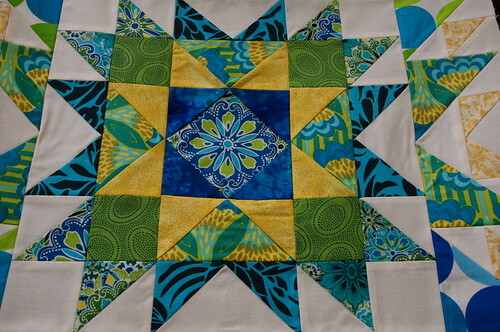 I think it's doable - after today I only have two blocks to make, plus the sashing, and quilting, of course! Modified Tradition Swap Inspiration, originally uploaded by Shadrach Meshach & Abednego. The truth is that I like just about everything, so you can't go wrong making something for me! 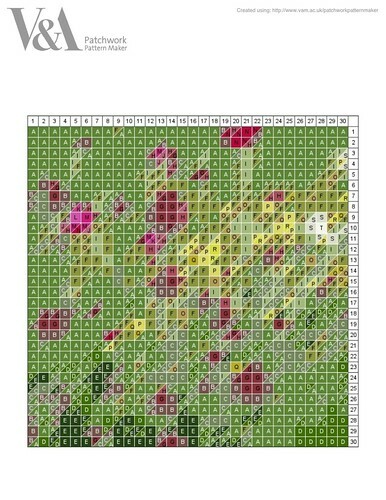 I like the way secondary patterns appear in traditional blocks when they are put together. I like snowballs and stars and shoo-fly blocks, as some favourite traditional blocks. Many of the backgrounds in these photos are white, but I like all colours of backgrounds, patterned and solid. I like all colours (except red, blue and yellow together, since those are the colours of the university I teach at! ), so go to town and have fun! 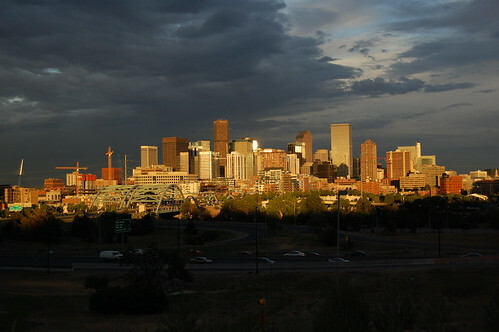 Denver Skyline, originally uploaded by Anish Palekar. I feel like I have been so neglectful of this blog the past ten days, but it has been unavoidable due to to two big conferences that have taken me south of the border and far away from my sewing machine and camera (this beautiful photo of Denver was borrowed from Flickr and is not mine, alas). But it's home, sweet home now, for a month, before we jet off to Boston. My latest travels took me to Denver for the American Educational Research Association conference. It was huge, with over 9000 delegates - the program was as big as the white pages for my little town! But I was not happy there, friends. Because why? The altitude was my enemy. I was prepared for the dryness and I drank a lot of water. But I was not prepared for the dragging sensation of fatigue and the feeling that I couldn't adequately fill my lungs. Not to mention the insomnia and the effect on my digestion. All of these are associated with altitude. Mile High City, indeed! It surprised me, because I've been to Boulder a couple of times for conferences and don't recall feeling so punk. I guess this is another sign of getting old! The conference was so-so, professionally. but an amazing thing happened that I couldn't wait to share with you! On Sunday, I came to set up for my session, and I noticed a gentleman standing near the speakers' table. I didn't recognize him, but, as I mentioned, it is a huge conference so it wasn't out of the ordinary. He approached me and asked if I were Lesly, since I wasn't wearing my nametag. When I said yes, he said "You don't know me, but my wife reads your blog and wanted me to come say hello." What??? I was gobsmacked!!! Clever Kristen had seen my status on Gmail listed as "going to Denver", and since her graduate student husband, Jesse, was attending this conference, too, she put two and two together. All kudos to Jesse, for approaching a strange lady with the "you don't know me, but..." line. Unequivocally, that was the best thing that happened in Denver! Cheers, Kristen!